Application is live. Apply Online! The Primary goal of YES is to encourage talented students to pursue science and engineering majors in high school and college; first, by expanding career awareness including information on “hot” career areas an increased presence of working scientists and engineers in local high schools , secondly, by allowing students to interact on a continuing basis with role models at SwRI. SwRI staff members, including females and minorities, recruit YES participants from local high schools by presenting talks and slide shows about their ongoing research projects. These presentations are given on a volunteer basis. During the academic school year, displays and presentations of the participants’ work in the local schools increase the benefits of the YES program by spreading career awareness to other students and teachers. The summer program and the academic year mentorship provide the students with a wide variety of role models, including a large precentage of women and ethnic minorities. 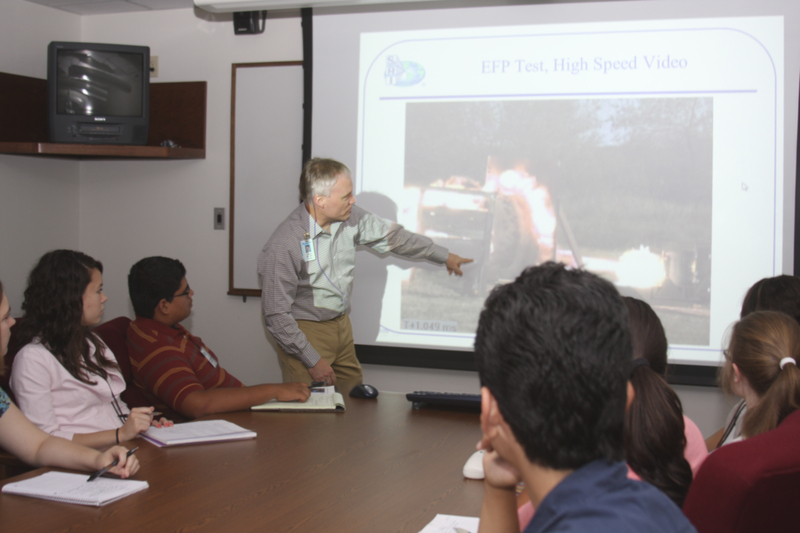 The program is divided into two parts: an intensive 3-week group training session held at SwRI in the summer where students are paired with SwRI staff members on a one-to-one basis, and an individual mentorship project completed during the academic year in which students earn credit at their high school. The secondary goal of the YES program is the retention of good candidate students in applied physics, information sciences, and engineering programs. These are the fields in which women and minorities are most underrepresented (Banditt, 1992; Pool, 1990). To address the problem of retention, YES emphasizes networking among peer students and mentorship between students and professionals already established in the field. Mentorship is recognized as a necessary component in professional development (Gibbons, 1992; White, 1970) and acknowledged as a critical component of development progr;ams for gifted and talented students (Beck, 1989). The importance of a peer support group is also widely noted (Council of Ontario Universities, 1988; American Association of University Women, 1992). The YES program had 20 participants during its first year (1993-1994) and presently 22 students are enrolled for the current academic year. Several students have completed or are currently working on projects in the information sciences (e.g., computer communications, virtual reality, fuzzy logic, artifical intelligence, graphics programming, etc.). The educational benefits of the YES program are multifaceted and impact students and teachers as well as the community. During the summer program, the students develop computer and mathematical skills necessary for solving research problems and learn the fundamentals of electronic circuit design. Students attend career exploration seminars on various research areas at SwRI and participate in discussions on scientific ethics, the social impact of technology, and the funding process. Training in time management, library resources, and public speaking are also given. During the school year, students work individually with their mentors on their independent study/mentorship (ISM) teacher. At the end of the school year, students present and display their work in local schools, acknowledging their accomplishments and spreading career awareness to other students and teachers. During the course of the school year, YES participants are also required to make presentations on science and engineering as career options to the larger community. For example, a student might meet this requirement by copresenting a talk on electrical engineering at a local elementary school Career Day with her mentor. Another option might be to sell prototypes of a puzzle designed in the course of the mentorship in the student store at her high school. Beyond the lasting benefit to the students, more mentors are cultivated for the future. Throughout the school year, teachers of the independent study course (ISM) in the local school district are closely involved with the YES student's research and product development. These teachers are able to observe first hand the movement of a student's learning from a foreknowledge and understanding level to real work application. The teacher learns what part of the school curriculum best supports the needs of a student preparing for a career in scientific research and engineering. In the one and on-half years that the program has been developing, there have been several instances that exemplify how teachers are willing to change in order to help the students more quickly function in a real world situation. Several of these examples demonstrate education. Three specific cases are summarized below. Keeping up with current trends in computer languages in one area where YES students have brought knowledge from their independent study experience to their classrooms. A computer science teacher at one of the high schools involved with the YES program is learning the C/C++ programming language with the help of the YES students in her class. This is in addition to the Pascal language that she has traditionally taught because her YES students are required by their SwRI mentors to program in the C/C++ language in their independent study projects. The teacher is now studying ways in which this new knowledge can be incorporated into her computer science classes. Drafting is another area where computer technology has recently made a major impact, where the interaction between the YES program and teacher education has resulted in cross fertilization. A drafting high school teacher participating in the YES program is updating his knowledge of computer-aided design (CAD) which his YES students are using in their independent study projects. One of the students is designing a hover craft and is doing most the planning on state-of-the-art CAD systems. He is studying methods to bringing this information technology into his classroom. In addition, the ISM teachers are becoming more faimliar with electronic computer networks for their YES students who want quicker and more in depth access to information for their research projects. Many of the YES students use electronic mail as the method to keep in regular contact with their mentors at SwRI. Modems for high school computers have been installed so students can access popular periodicals for background information as well as primary information at a variety of Internet sites using the World Wide Web software. The teachers have become involved with this activity and are learning how best to use these resources for their benefit as well as for their classes. Because some of the work requried of the students through the YES program is not best support by traditional library research, teachers of independent study are providing the opportunity for students to learn by other means, such as trial and error experimentation, personal interviews of SwRI staff members, and observation of staff members' research. Documentation of the student's learning is maintained in a research portfolio which is monitored and evaluated by the ISM teacher and the SwRI mentor. Both the teachers and the students are learning together, with the student guiding the teacher to what is best needed for their real world experiences at SwRI. At the end of the school year, other teachers, students, and members of the community are invited to a final presentation to see the student's product and hear of their investigation through a formal speech. These presentations have been influential in motivating participation of more students for the academic year. As a result, twice as many applications for the YES program were made the second year of the program. An important area of expansion for the YES program is to provide more opportunities for high school teachers to participate in the student-mentor partnership in future years to enhance the impact of information technology on the education of teachers involved with YES. This research was supported by the NSF Young Scholars Program (Grant ESI-9256066) and the Southwest Research Institute. American Association of University Women (1992). Shortchanging girls, shortchanging America, A call to action. Washington, DC: Author. Benditt, J. (1992). Women in science-Pieces of a puzzle. Science, 255, 1365. Beck, L. (1989). Mentorships: benefits and effects on career development, Gifted Child Quarterly, 33. Council of Ontario Universities (1988). Attracting and retaining women students for science and engineering. Ontario: Aurthor. Gibbons, A. (1992). Key issue: Mentoring, Science, 255, 1368. Pool, R. (1990). Who will do science in the 1990s. ?, Science, 248, 433. White, M.S. (1970). Psychological and social barriers to women in science, Science, 170, 413. Judith Hooper is an Independent Study/Mentorship Teacher at Northside Independent School District, Programs for Gifted and Talented Children, 11600 FM 471 West., San Antonio, TX 78253. Telephone: (210) 688-6088, FAX: (210) 688-6072.